Quicktoron is a device to remove air bubbles from liquids. It’s based on the cyclone principle, and very efficiently eliminates all the fine air bubbles trapped and mixed inside the fluid. Quicktoron also helps to retain the filtration performance of filter elements. Most air bubbles have a larger sizes than solid contaminants. 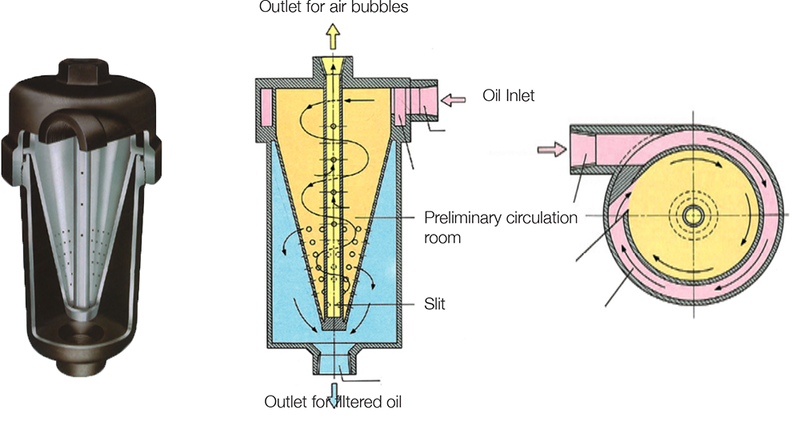 When these air bubbles go through the filter elements, they create bigger channels, allowing contaminants to pass through without being captured, and dropping filtration performance of the oil filters. Quicktoron devices are very compact, easy to install, and offer a very economical solution to remove air bubbles quickly and efficiently. Typically Quicktoron is used in combination with our OSCA-series. Creates excessive noise and vibration. Increases friction and wear of moving parts. Accelerated metal corrosion. Lower cooler efficiency. Eliminates up to 95% of all air bubbles! Allows to use a small oil reservoir, very common in case of mobile equipment. Avoids pump cavitation and improves machine reliability and component life.